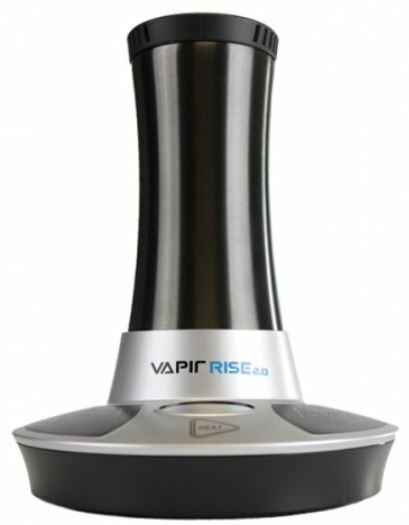 Vapir Rise Vaporizer will provide a great experience with vaping medical marijuana. It can be used for medical marijuana herbs, wax/oils and CBD oils. Overview – How Can Vapir Rise Vaporizer Help You? Vapir is known for creating quality desktop vaporizers. The company has been around for a long time and has many successful popular vaporizers. The product we’re reviewing today is the Vapir Rise Vaporizer. This is another product added to their arsenal of high quality vaporizers. What makes the Vapir Rise Vaporizer unique is its ease to use out of the box and new no fan mode, which is perfect for a casual vaping experience. It’s important to note that you can use the no fan mode to smoke both herbs and waxes or oils. If you like mixing things up between medical marijuana and CBD oil for instance, then this device will fulfill your needs. So what makes the Vapir Rise Vaporizer perfect for both herb and oil/wax vape sessions? Well, as we mentioned earlier, it’s easy to use and everything you need comes in the box. There’s also the no fan mode, which allows you to use the whip-draw operation without the forced air function. 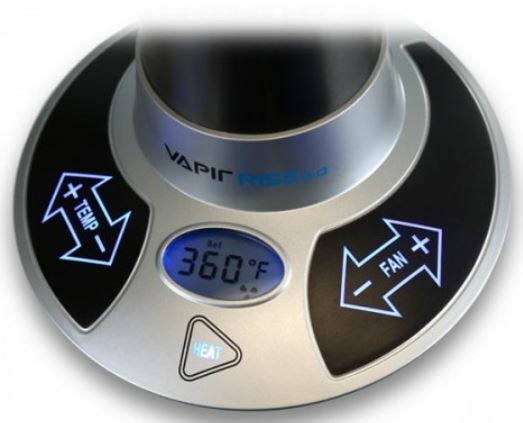 The Vapir Rise Vaporizer can also reach temperatures of up to 420 degrees Fahrenheit and the heating chamber is both highly efficient and easy to clean. Temperature control is something that people worry about in desktop vaporizers. The Vapir Rise Vaporizer has a digital screen that shows the actual temperature accurately. It also has a touchpad for easy manipulation and temperature control. Something I personally like is that it can display the temperature in either Celsius or Fahrenheit according to your personal preference. The vaporizer is so efficient that it can reach the required temperature in less than a minute making it one of the fastest vaporizers on the market. A few vaporizers come with a dual functionality system. This means that you can use the device through a whip system or a balloon bag system. The truth is that most vaporizers with dual functionality don’t do their job very well. Vapir Rise Vaporizer is the exception as it does both in an exceptional manner. So far all sounds good. The product works with both herbs and oils/waxes. It has a dual functionality and a no fan mode. The temperature control settings are advanced and simple to use in addition to the device reaching high temperatures within a minute. One question remains: ‘is it durable and of high quality?’ Considering the warranty is only 2 years, rather than 3 like most competing products, it’s important to know if the device will last. Its components and manufactured material used are all of excellent quality. The vapor path is made of stainless steel, which allows for a clean vapor with unaltered taste. The vaporizer also works silently, which for someone who hates noise, like I do, is amazing. It also has a ceramic heating element and HEPA air filter that contribute to healthy and clean vapor. • Plug in and turn on the unit. • Once the unit lights up adjust the temperature using the arrows and press heat. • The button turning red will notify you that the heating process began. • Adjust the temperature and fan to your liking using the touch panel. • Use lower temperatures for THC and higher temperatures for CBD. • Grind the herbs and insert them in the chamber while the unit heats. • Snap the chamber adapter on the herb chamber. • The button turning green is your cue that you’re ready to vaporize. 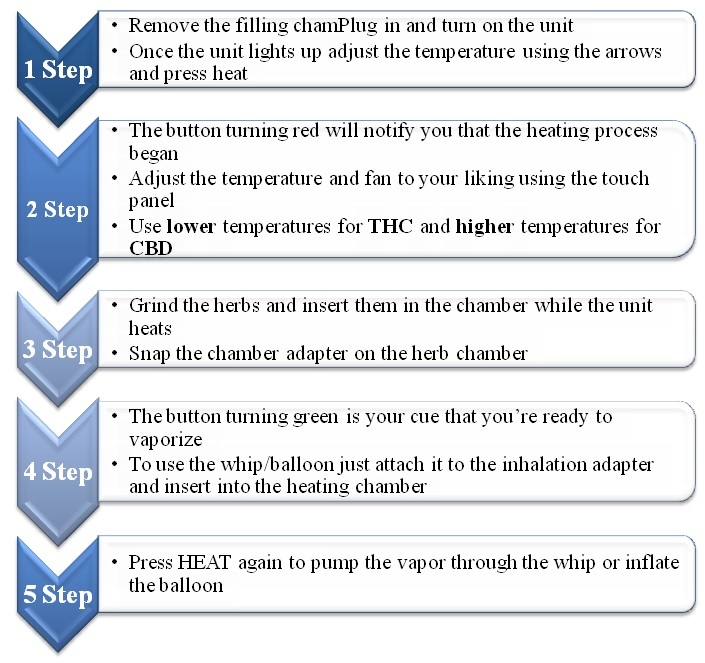 • To use the whip/balloon just attach it to the inhalation adapter and insert into the heating chamber. • Press HEAT again to pump the vapor through the whip or inflate the balloon. 1.Lower temperatures with THC will provide better taste. 2.Higher temperatures with CBD will provide a more sedating effect. 3.Soak the whip in warm water before first use. 1.Remove any debris using the wooden stick and brush that come with the device. 2. Clean the chamber using a Q-tip with a little rubbing alcohol. 3.Make sure to clean the vaporizer every once in a while for optimum performance. 1. Price is reasonable considering all great features. 2. Dual functionality: whip or balloon bag systems. 3. Durable and made of high quality components. 4. Can be used out of the box with no difficulties. 5. Can be used to vape medical marijuana herbs or waxes and oils. 6. Portable and you can take it with you when you travel. Customer support Vapir Rizer Vaporizer is provided www.vapornation.com by e-mail, chat and phone line. www.VaporNation.com’s customer service will help you with any problems you face. Our final verdict is that this is one of the leading vaporizers on the market today. That’s why we’ve given it a 4.1/5 rating. It can be used to vape herbs as well as waxes/oils, has dual functionality, and customers who have used it are extremely satisfied with the device. If you’re looking for something that will give you a great experience with medical marijuana and CBD oils, then you might consider the Vapir Rise Vaporizer. Thanks for following our Vapir Rise Vaporizer review. Hope we were able to demonstrate all of the device’s good qualities and its very few flaws. If you have experience with this desktop vaporizer then please let us know so that others who are still on the hunt for a vaporizer can benefit from your experience.